Webmaster’s Note: Because of the way that CAN constructs its message, hyperlinks in this copy of the message may not work. New Bills Impacting Homeowners’ Associations Filed for 2016 Legislative Session Florida Condo & HOA Law Blog, December 29, 2015. New Bills Will Significantly Impact HOA Operations in Florida Florida Condo & HOA Legal Blog, November 25, 2015. HERE WE GO AGAIN. THE TERRIBLE “ESTOPPEL BILL,” DEFEATED IN PAST LEGISLATIVE SESSIONS, AGAIN REARS ITS UGLY HEAD AS HOUSE BILL 203! Click the link HERE to hear a January 23rd interview by radio host Gene Sullivan of WWTC radio with SCCA’s President Roger Kesselbach about Florida House bill 203 and its companion, Florida Senate bill 722—together referred to as “the estoppel bill.” WWTC (1280 AM, “The Patriot”) is a long-standing radio station serving the Minneapolis–Saint Paul region. Today it broadcasts a conservative talk radio format. Sullivan’s weekly “Where You Live” program explores some aspect of what it means to own, rent, or invest in real estate. Sullivan is also the President and CEO of New Concepts Management Group, Inc., a property management firm. Webmaster’s Note: The program begins with general news. If you wish you can click on the bar that runs across the bottom of the page to move forward in the broadcast to reach the interview, which is the first story following the news at about 8 minutes in. It runs to about the 32 minute point. CAN Alert: YOU CAN help Stop SENATE BILL 722 (The Home Tax) January 11, 2016. IMPORTANT: The hyperlinks to the petition in this post do not work, but you can reach it by clicking HERE. IMPORTANT: The hyperlink to the petition in this post does not work, but you can reach it by clicking HERE. Full “Smash the Home Tax” Press Conference Speakers include SCCA President Roger Kesselbach. 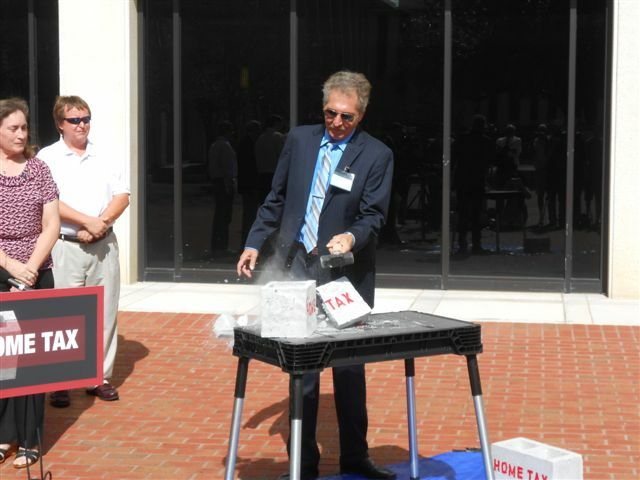 SCCA President Roger Kesselbach symbolically “smashes the home tax” at the event. CAN Alert: HB 203 Passed 11 to 2 – Still a Win in Our Book. Here’s Why November 5, 2015 Note: The hyperlinks in this copy are not active.